It smells like snow. I can’t describe it, really. If you’ve grown up in an area that gets a good amount of snow in the winter, you know it. It’s crisp, distinctive. I learned the smell early in life in the Midwest, as it crept in, sometimes hours in advance of a storm. In Moscow, the smell was often masked by the dirty air of the city, but it was still there. I don't smell it very often here in Maryland, so when it happens, it feels so good. If I know snow is coming, I close my eyes and breathe deeply. The familiar scent floods my nose, my head. When I fill my lungs with that air, I feel better. Calm. Peaceful. I can briefly fool myself that the air is cleaner and healthier when snow is the fragrant note. Last night, I breathed in, hoping to catch snow on the breeze, but there was none yet. Tonight, it’s here. I have my windows open, as the mild temperature of the day drops and the light rain outside hovers above freezing, on the verge of laying down a sheet of thin ice that will be cloaked in white overnight. I need to close the windows soon, before the snow air I love begins to sting my nose and lungs, still aching from the cold that will not quite leave me. My lungs offer up a quiet rasp only I can hear in my chest and head. It's time to heat some water for tea and turn off the overhead lights that seem too strong now. 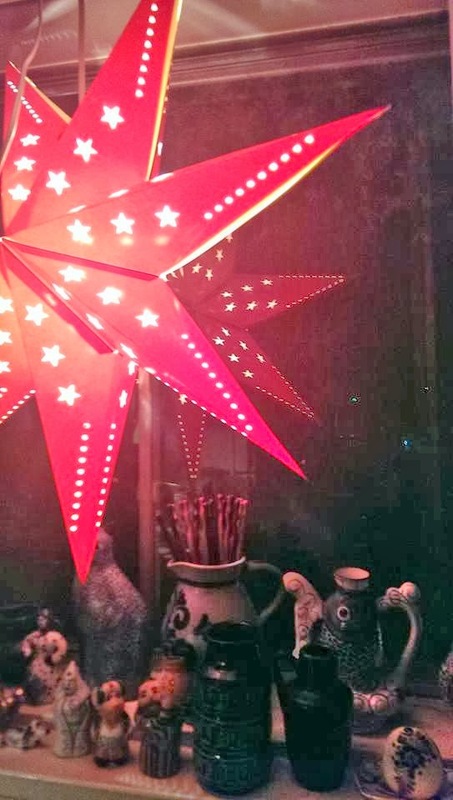 I have white twinkle lights in my living room and a red paper star in my kitchen window, never taken down from Christmas. I’ve decided the star isn’t a cheap holiday light, but simply something warm and welcoming for the dark space of my solitary nights. It makes me feel a little less alone. Especially now. So it stays. I don’t know how much life there is in a ten dollar light cord wrapped in a glossy cardboard shell, but I intend to embrace every last lumen it offers. Save for someone in their final hour on death row, we don’t know when our last lumen will burn out. I feel l have wasted so much of my own light, as dim as it might be, and I am 48 years into my life now. I have made so many commitments to myself over the years—in creativity, health, a search for love and partnership—that I have let fade away. I need a reason to want to succeed, to thrive, to want something. When I was a teenager, my father belittled me. It was painful, and I was not mature enough to understand his own bitterness about his life then. Not sure I am mature enough now, honestly. Back then, I had an elaborate set of imaginary worlds in my head where I could retreat from reality while hiding in my corner bedroom, sitting at my drawing table with my pencils and notebooks, and my radio. I am sitting at that same drawing table right now. The pencils and notebooks are here with me, as is a radio. The only difference is the addition of technology and the older, sadder, less agile body. So many years later, the memories of my father’s outbursts are here with me too. “It’s a good thing she’s smart, Jerry,” I can hear him say snidely to my mother. “She doesn’t have a damn thing to offer a man.” I was seventeen, and I was in the next room. My father was a very smart man. He really didn’t like me, but he was a very smart man. And I hate that my life has demonstrated him to be right about me in many ways. So, what do I do? Where do I start? I’m not even sure which things to try to finish first, or which things to jettison as unrealistic at 48. But if I just continue to spend all my time thinking and not doing, the clock will wind down, and my own bulb will dim and sputter without really throwing any good light. So, I wait for the snow, now heavier on the air and mixed with the incense of wood fire from the house next door. I wait for the cold to be too much for me to take, sitting by the open window. I wait for my mind to settle on what to do next. And then, I have to stop waiting. I need to start being happy. I hope to see a field of fresh white when I wake up tomorrow. And I’ll make my own mark in the snow and choose my own path to leave in the fresh white. Most probably, that path will initially just be to my car in the parking lot, dragging a shovel and scraper in my wake. But it's somewhere. It's a start.